Predator, the 1987 film from director John McTiernan, is among my favorite action and sci-fi films. It’s one of those dumb 1980s action flicks that it’s easy to turn one’s nose up to, but which is actually pretty damned good. I would like to try making an honest effort at not comparing the sequel unfavorably to the original, but that’s just going to be too hard. Predator 2 is the follow-up to Predator, and was released in 1990. McTiernan wasn’t around to direct this one, having hit it big with Die Hard. Directing duties were handled this time around by Stephen Hopkins. Most of his work has come in television. Of his feature films besides this one, well, once upon a time I had the Judgment Night soundtrack on CD, but that’s about all I remember of that film. 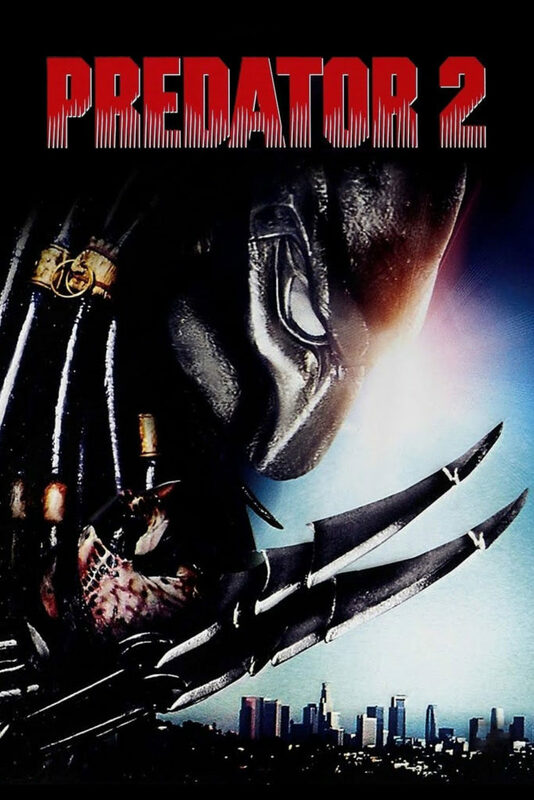 But, the original Predator’s screenwriting team of Jim and John Thomas returned, so that’s a good sign that this sequel was treated with the care befitting the original. Or, it’s just a cheap cash grab. Besides McTiernan, Arnold Schwarzenegger, star of the first film, is also gone, off to do a trio of milquetoast family comedies with Ivan Reitman in between blowing stuff up in movies with bigger budgets. The star this time around is Danny Glover as Lieutenant Mike Harrigan of the LAPD. As one could guess, the setting has also changed, moving from the jungles of Central America to the gritty streets of Los Angeles, in the not-too-distant year of 1997. So, are there any other changes of note? No, there are not. But there is a returning cast member from the first film that a viewer wouldn’t pick up on unless they pay attention to the credits. Kevin Peter Hall returns to play the predator. It’s a different predator than in the first film, but it’s the same guy behind the mask. The Los Angeles of 1997, as depicted in Predator 2, is a dreadful place. Rival Colombian and Jamaican drug gangs are at war in the streets. I’m not referring to drive-by shootings or any other such nonsense that would have been de rigueur for urban street violence circa 1990, but straight up warfare. Machine guns, 40mm grenades…these gangsters have gone tactical. It’s a bit odd to see the filmmakers’ idea of what Los Angeles might be like less than a decade from filming. But, it was a bit of a bad time for crime in American cities. Had things continued on the same trajectory of the ’70s and ’80s, maybe narco armies would have been battling in the streets by 1997. Lieutenant Harrigan is a tough cop in a tough part of the city, and the unit under his command — Danny Boy (Ruben Blades), Leona (Maria Conchita Alonso), and Jerry (Bill Paxson) — are the area’s woebegone anti-gang task force. Lately, during the worst of the fighting, Harrigan’s gang targets keep getting killed in the most grisly fashion, and his team must find the culprit. The killer is, of course, the predator — a member of an alien species that likes to come to our planet so it can hunt gun-toting badasses as trophy game. To the predator, morality is of no concern. Good guys, bad guys…it doesn’t matter. If a character is armed, then they are a potential target for the predator, making the alien creature just as much of a threat to Harrigan and his people as it is to the gang members. What follows is Harrigan’s struggle to find the predator and make America’s armed gangs safe to kill each other once more. One of the most perplexing things about Predator 2 is that it looks cheaper than the first film. Doing research for this review, I was expecting to find that Predator 2 was produced on a smaller budget. Instead, it turns out that Predator 2 had twice the budget of its predecessor, clocking in at a cool $35 million. Where did all the money go? The sets aren’t that special. The soundtrack is little more than a rerecording of that used in the first film. Even the special effects are worse, the shimmer effect used to represent the predator in camouflage looking off. Maybe Danny Glover was responsible for a big chunk of the budget, commanding good money after a string of hits turned him into a star. Whatever the reason, Predator 2 looks and feels mailed in, in the opposite way that Predator felt meticulous. Such a drop-off in quality, despite an increase in budget and a screenplay that was just as good as in the first film, has to be laid at the feet of the director. Predator 2 is a film that requires no close scrutiny from the audience. It’s a dumb action flick designed to fire our more animalistic neurons. Action films are good in that way. But there’s a competence to McTiernan’s film that Hopkins doesn’t reach, even though his goals were the same. Predator 2 is bold in the way it strikes out on its own, in both location and scope. It tries to break the associations made by those viewers familiar with the first film. I do not know how Hopkins and company succeeded in doing that, yet still produced a film that is as much pale imitation as it is sequel. Still, Predator 2 is not a bad film. It’s just mediocre.